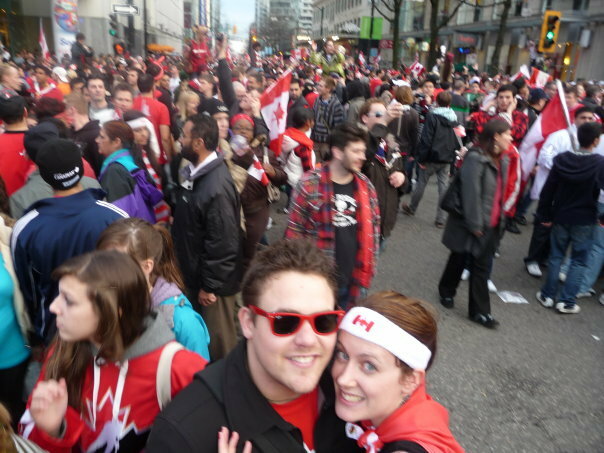 Wandering the streets of Vancouver in celebration of Canada's Gold Medal in Men's Hockey. 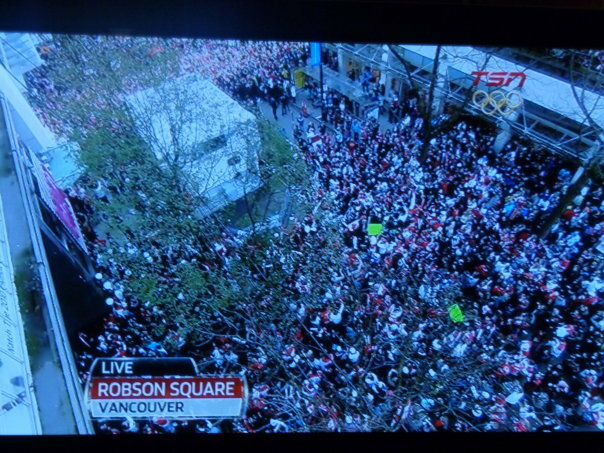 It has been seventeen days straight of excitement, madness, spending, gorging, drinking and screaming for Vancouver. The 2010 Winter Olympic Games are over. For some this is a non-issue. 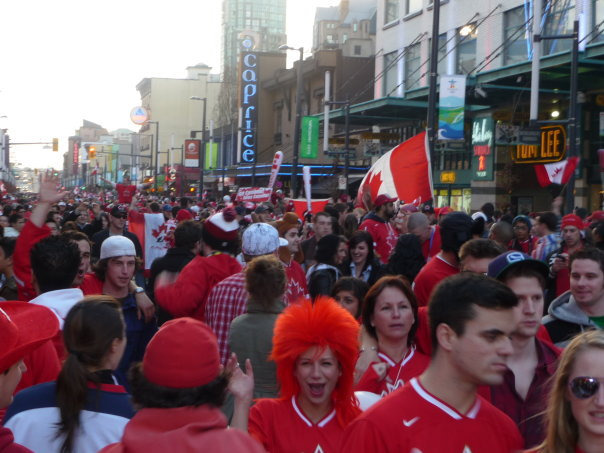 For thousands it is a close to an event that brought some of the most memorable Canadian pride-filled moments in recent history. Never before have I witnessed Canadian pride like this in my hometown. Out here on the west coast, we are far removed from the nation’s centre of the universe, where July 1st Canada Day parties run rampant and cities spend hordes on breathtaking celebrations of the red and white kind. 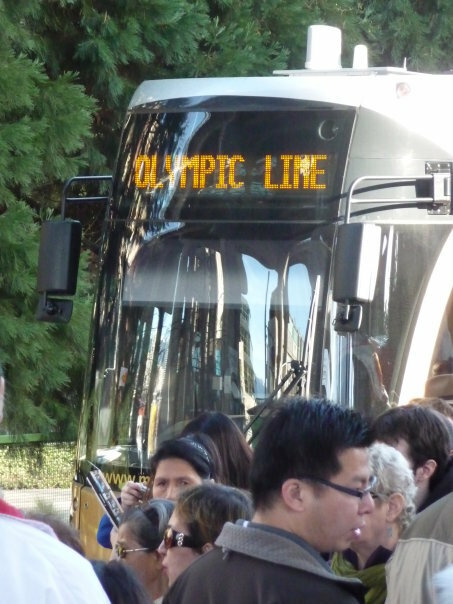 The Vancouver Olympics Games were seventeen days worth of July firsts. And now, we have to go back to work. 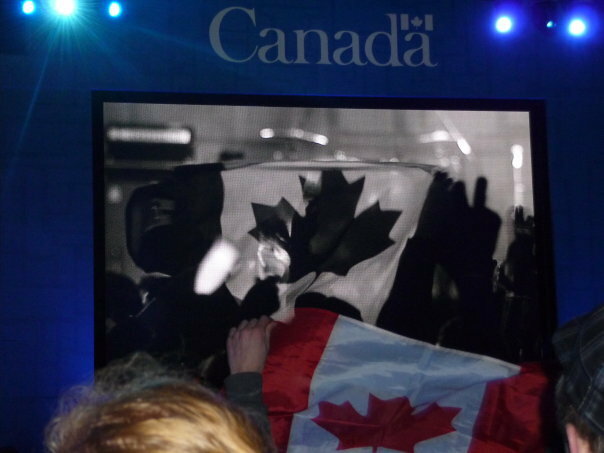 Canadian flag caught on screen at Yaletown LiveCity. For those that embraced this cross-country party, there was a little emptiness felt when the Olympic flame was distinguished during the closing ceremonies as our homegrown boy Neil Young sang Long May You Run. The red and white, the camaraderie, the revelry and festivity will be missed. It felt good to come together and focus on joy; to let our worries slip away. But now it is back to reality and the daily grind. The bills, debts, problems, issues, complaints, grumbles and grieves of our daily lives. This isn’t the kind of hangover cured with Tylenol. This is more like a hot-air balloon deflating. And then hopefully we get off our butts and maintain some engagement in our city and in our country. We don’t need a million dollar excuse to walk from one end of town to the other, to start conversations with people next to us in line or on the bus, to have a good laugh alongside complete strangers. We don’t need an organizing committee to convince us to get involved, hold our hands and lead us to events. The real legacy of the Games will be a city that grows up, takes charge and keeps the stick out of its you know what. So here is to a speedy recovery and a Vancouver that is wiser, livelier, freer, more sociable and proudly Canadian. City Caucus seems to be the best place to keep updated on these Olympic and Paralympic-related activities.